Lassie was a drama series that went through several transitions during its 20 years on the air. It began with the beautiful collie living on a small farm with its young master Jeff Miller, Jeff's widowed mother and grandfather. In the spring of 1957, an orphan boy named Timmy joined the Miller household. By that fall, Jeff's grandpa died and his mother decided that she and Jeff could not maintain the farm by themselves. The farm was sold to Paul and Ruth Martin. The Martin's were childless and were thrilled to have Timmy and his dog stay with them! In 1964, the Martins decided to leave for Australia where homesteaders could get free land. Timmy went with them but could not take his dog due to Australian animal import regulations. For a very short period of time, Lassie was left with Cully Wilson, a friend of the Marin family. When Wilson suffered a heart attack, Lassie went for help and found forest ranger Corey Stuart. The TV show continued that way until until the fall of 1968 when Corey was seriouly injured fighting a forest fire. Lassie was then "adopted" by two other rangers, Scott Turner and Bob Erickson. During this period, the TV show began to center more and more around Lassie's adventures and less on her relationships with her human masters. By the 1970-1971 season, Lassie was on her own and met a male Collie. They even had a litter of puppies together. CBS dropped the TV show at the end of that season but it continued three more seasons in syndication. In the final season of syndication, Lassie finally regained her human companionship when she joined the Holden family on their ranch in Solvang, California. Additional Episodes were produced from 1971 thru 1974 for sydication. Air Dates varied per station. Lassie was based on the 1938 short story in the Saturday Evening Post written by Eric Knight. Then, in 1940, Mr. Knight followed up with a best-selling novel also titled, "Lassie". In those stories, Lassie was owned by a poor family who was forced to sell her. Then Lassie had to find her way back to them despite many obstacles. There was also a Lassie radio program from 1947-1950 and several movies and other TV shows (see bottom of this page for more details). 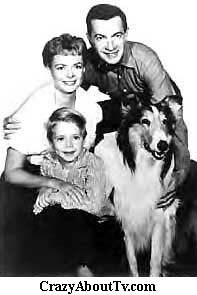 This series was also known as "Jeff's Collie" from 1954-1957 and as "Timmie and Lassie" from 1958-1963. Ken Osmond who played "Eddie Haskell" on the series, "Leave It To Beaver (1957)", guest-starred on the very first episode of "Lassie". Twelve and one-half years later, he guest-starred again on episode #435, "A Matter Of Seconds". Suzanne Somers, best-known as "Chrissy" on the show "Three's Company (1977)", got her second credited role on screen in January of 1965 on episode #369, "High Water". Her only credited TV role previous to that was in October of 1963 in a guest role on, "Ben Casey (1961)". The show won three Emmys during its run. In 1955 & 1956 for "Best Children's TV Program" and, in 1959, June Lockhart won for "Best Actress in a Leading Role in a Dramatic Series". Most of us from that era remember June Lockhart as Timmy's "steadfast" mother (or later as the same type of mother on "Lost In Space"), but in real-life, she was a real human-being. She got fired as the co-host of the "Miss U.S.A. Pagent" for "living in sin" with a much younger man. A real scandal in those days! June's interest in Space Exploration resulted in her often appearing at events with astronauts! Her daughter June appeared on the series, "Petticoat Junction (1963)" in the role of Doctor Janet Craig - one of the first female doctors seen on television! Tommy Rettig was chosen from more than 500 auditioners to get the part of Jeff Miller, Lassie's first TV master! That was probably the high point in his otherwise troubled life. Tommey got very few adult acting jobs and otherwise experienced the same "let-down" of many child actors. After a drug conviction, bankruptcy and divorce, he died at the young age of 55. In his final years, however, he became a well-known and respected Software Developer. He was considered an expert in Dbase and FoxPro applications. After Lassie, Jon Provost (Timmy) went to college at Sonoma State University. He sold real estate for a while and then worked in business development. George Cleveland is possibly best remembered today in his role on Lassie as "Gramps". He had, however, by that time already accumulated 50 years of entertainment credits. Starting on the stage and in vaudeville, he also acted on several radio programs and approximately 150 movies! Remarkably, his only other appearance on a TV series was a guest-starring role on one episode of "The Adventures of Wild Bill Hickok (1951)" where he also played a grandpa! Title: "The Secret of the Silent Hills"
I learned a secret that I will share with you. The Secret of the Silent Hills. Only true words, we should not forget. Love can cure the world of all its ills. And that's the Secret of the Silent Hills. At this point, the series was dropped by CBS and went into syndication. Air Dates varied at the whim of the stations which carried the show. Lassie (1997) - On "Animal Planet"
Thank you for visiting our Lassie TV Show page!